Ranked by total dollars raised, the top three candidates are: Clinton (38% of all money raised), Obama (29%), Paul (22%). Together, these three candidates took in 89% of the money contributed. 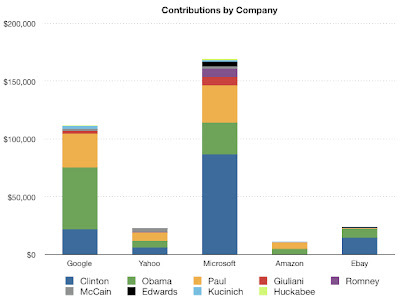 Clinton raised the most money with 68% coming from Microsoft employee contributions of $86,360. In terms of raw dollars, both Microsoft and Ebay employees prefer Clinton, Google employees prefer Obama, Yahoo and Amazon employees prefer Paul. Microsoft employees contributed the most money in total at $169,421, but Google contributed the most per employee. Google employees contributed $111,160 which works out to $6.61 per capita (based on end of year head count data). This far exceeds the other four companies' per capita contributions which range from $0.64 (Amazon) to $2.14 (Microsoft). Given the strength of Ron Paul's fund raising, I'd conclude that technology workers skew fairly libertarian. And not as liberal as you might expect given that neither Kucinich or Edwards did not fare particulaly well. The presumptive GOP nominee, John McCain, was in 4th place among Republicans. Huckabee was the worst-performing Republican ($1,550) and Kucinich the worst-performing Democrat ($4,250). it is sort of unfair to compare the companies with the per capita stat at least for amazon. Since amazon is mostly a retail company. A great deal of it employees are lowered paid people who work in the warehouses and pack ship orders. As where the other companies you have stated are higher paid software engineers and other office jobs. Well, I think there are all kinds of reasons why the per capita stat could be swayed. Employee wealth is certainly a fair point. Another reason is that Google has invited most of the candidates to come speak at the campus and many have. Still, even on a non-per capita basis Amazon donated the least. And you could remove 10,000 people from Amazon and they'd still give the least per capita. May I reprint your first image at Google Blogoscoped? Credited and linked of course. Thanks! Goldman - I had no idea I had been canonized, let alone deified. Shoot me an email, joleske2000 at yahoo dot com, we should catch up. As I learned in my education class the other day: the rich can afford/have the luxury to be idealists. The poor, not so much. And most people who work for technology companies are wealthy or at the very least upper-middle class (and from predominantly wealthy backgrounds). Thus, most people at tech companies support the overly idealistic likes of Ron Paul and Obama. Anyways, I thought the statistics you pulled were interesting, but as Mark Twain said: "There are real liars, plain liars, politicians, and then there's statisticians." Cool graphs, thanks for sharing. He's got the Trinidad vote!